Our three part local inbound marketing strategy is simple. Get found. Get favored. Get Fans. This strategy is measured by tracking inbound website traffic, the conversion rate of inbound traffic, and the total value of inbound customers. Solid Stratagems works with brands that wants to double each of these three indicators. Doubling all three parts of the inbound strategy results in 8 times current inbound revenue. Can companies actually generate 8 times their current inbound revenue? You bet they can! And much much more. #1) Location(s): Choosing the right market can have a huge impact on growth and marketing returns. Companies in the pre-startup stage or companies considering expansion should take advantage of careful market analysis. #2) Campaigns: We define campaigns as products or services that are being proactively marketed to a target audience. Extensive market and keyword research helps companies optimize and prioritize existing campaigns and/or identify opportunities for new campaigns. #3) Web Presence: Having an optimized website is good. Having an optimized site, with optimized pages, blog posts, search engine profiles, review site profiles and search engine profiles is better. #4) Rankings: Higher search engine rankings are extremely helpful and allow companies to reap the low hanging fruit. Content is still king. #5) Click Through Rate Optimization (CTRO): Some search engine results get skipped right over, others can be almost irresistible. Increasing your web pages’ click through rates is one of the quickest ways to increase traffic. #6) Landing Page Optimization (LPO): Through data we’ve learned that the first impression searchers get when they land on your page is very difficult to change. This can either be a really good thing or really bad. #7) Pricing Page Optimization (PPO): Pricing pages are a great pages to A/B test and provide lots of opportunity to communicate value, transparency and flexibility. #8) Sign Up Optimization (SUO): It’s depressing how many potential buyers choose they want to make a purchase but don’t complete the sign up process. When you’re done optimizing the sign up process, there won’t be a process. #9) Total Customer Value (TCV): Nothing is more important than winning loyal customers, nothing. #10) Profit Margin (PM): As customer volume increases some costs decrease. 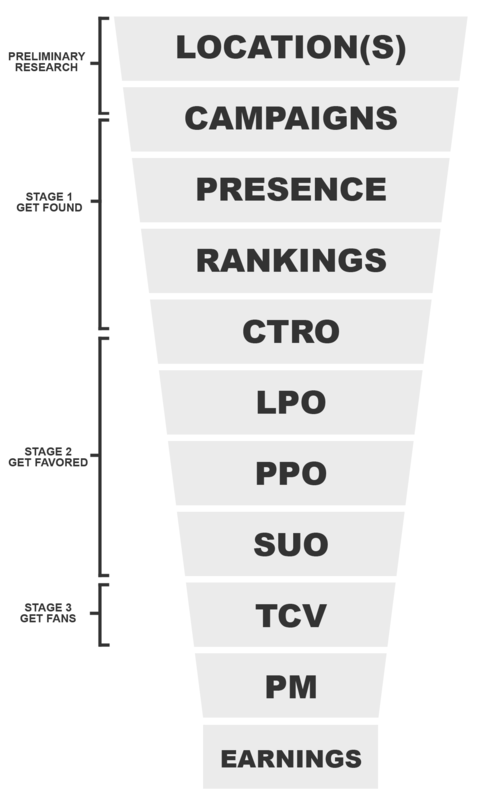 This is an unintended benefit of optimizing the inbound sales funnel.